With the mobile, connect-to-any-Wi-Fi-you-can-find lifestyle comes a certain amount of risk. It's not a simple deal, but unscrupulous types can hack unencrypted communications between your mobile device and Wi-Fi hotspot or routers. That's where F-Secure's Freedome--a combination of VPN (Virtual Private Network) service and malware protection for your iOS or Android device--steps in. VPN services are nothing new. A VPN is a secure, encrypted connection between you and another computer (or Internet appliance). In the case of a VPN service, said computer is a remote server that relays Internet traffic to and from you using its IP address, hiding yours. If you're in San Francisco surfing via VPN through a server located in Denver, then for all intents and purposes, denizens of the Internet think you're in Denver. While a VPN service assures privacy, there's a performance penalty. How much depends on your location, the location of the relay server, and the infrastructure in between. I tested Freedome from here in heavily-provisioned San Francisco using my iPad and Ookla's free Speedtest. I didn't take much of a hit at all: about 0.1 megabits per second downloading and 0.05 megabits per second uploading. That was using a U.S.-based server that Freedome states is in northern Virginia. Freedome also has overseas servers, though not the slew TunnelBear offers. Freedome's are in London, England; Espoo, Finland (F-Secure's home); and Sachsen, Germany. This can be handy if you're traveling to those countries or simply want people to think you're there. I'll leave the creative uses of a foreign Internet identity to your imagination. The performance hit was decidedly heavier in those locations, however, thanks to the ever faster Internet infrastructure, but not as much as you might think. I tested VPN services 10 years ago that drooped far worse using a server in Los Angeles, let alone one in Germany. While the Freedome app is simple to use, and the Android version is just on/off, you can't simply disable the iOS version using the normal VPN switch--it turns itself back on. 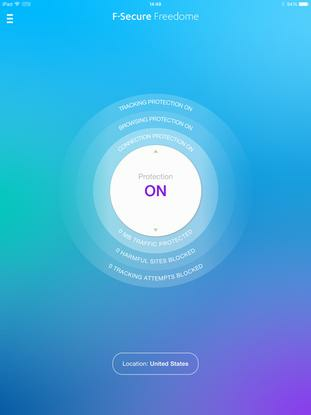 Instead, you turn it on or off and choose a different server using the app; the app communicates with the F-Secure Web site, recreates the Freedome VPN profile and you re-install. This is the same way other VPN services install under iOS, but after that they can be turned on and off using the VPN button. It doesn't take long, just a few more steps. The circuitous configuration is one way Freedome protects you from malware. Of course, I've never had any sort of malware attack any of my mobile devices, so I can't say if this or any other measures Freedome takes are actually necessary. I can tell you that F-Secure's Android security was ranked just a tiny bit lower than such heavyweights as McAfee, Avira, and eSet, as of March 2014. Effective, just not quite as. If you're worried about secure communications, want to hide your actual IP address, or need to spoof your location, Freedome can do it. It's also very affordable: $30 a year, or $5 a month. The iOS version isn't quite as simple to turn on and off as Hotspot Shield or TunnelBear--or even the Android version of Freedome--but that makes it less vulnerable to being disabled by another app or malware, should that be an actual concern.